In SWEET COUNTRY, a kaleidoscopic survey of Pinochet's Chile, General Pinochet, a state security agent, the mother of a disappeared prisoner, and an exiled political leader are interviewed to illustrate Chile's "National Security Doctrine" according to each's experience. The consequences of the economic model adopted by the government are described by an economist - and a hunger victim. Finally, a priest, political activists, and leaders of labor, student, and women's movements provide a vision of the many facets of the struggle against dictatorship which has - perhaps - been won. 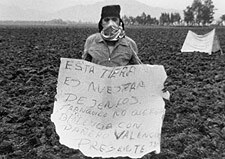 Patricio Guzmán's landmark film The Battle of Chile(1976) documented the "Popular Unity" period of Salvador Allende's government, the tumultuous events leading up to the 1973 coup, and Allende's death. Guzmán has returned to show The Battle of Chile in his homeland for the first time, and to explore the terrain of the confiscated (but reawakening) memories of the Chilean people. Documents the workings of Chile's Forensic Identification Unit in its quest to reclaim the identities of those 'disappeared' and killed during the Pinochet dictatorship.